If I had to pick one Food Network chef/cook to be my go to recipe source, it would hands down be Ina Garten, the Barefoot Contessa. I have all but one of Ina's cookbooks and have had overwhelmingly positive success with her recipes. What I love about Ina is her recipes aren't overly complicated, yet they have a wow factor. And most importantly, they are delicious. I have had my eye on Ina's Roasted Shrimp with Cocktail for a few years now. This recipe comes from her book, Back to Basics--one of my favorites. I was in search of a healthy appetizer for our recent dinner party and I remembered this recipe. It did not disappoint and it's incredibly easy to make. It's even easier if you buy shrimp that is already peeled and de-veined. We almost always buy our shrimp, uncooked, peeled, de-veined and frozen from Costco and simply defrost. What I like about this recipe is it is a twist on the traditional shrimp cocktail. The simple step of roasting the shrimp in olive oil, salt and pepper, makes all the difference in creating the wow factor for this appetizer. The cocktail sauce is homemade and has a nice tang with a horseradish kick. I wish I had more photos to share...like the baking sheet with all the pretty pink roasted shrimp when they just came out of the oven. Or the final plated dish with the shrimp circling the bowl of cocktail sauce, lemon wedges interspersed. But lighting was not good and I might have been mildly stressed anxiously waiting for our dinner guests to arrive. Luckily one lonely shrimp was left over and I took this photo the next morning. If you like shrimp cocktail and you are looking for an easy appetizer, this is a great choice. Combine all the sauce ingredients in a medium bowl and stir until well combined. The sauce can be made ahead and refrigerated until you are ready to serve. Serve roasted shrimp with cocktail sauce and garnish with lemon wedges. 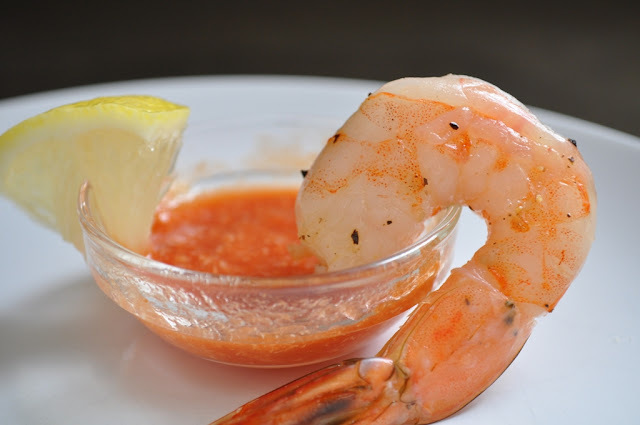 Hey, at least you had one shrimp left - it looks great and is a good idea for a NYE appetizer. "The Barefoot"'s (that's what we call her at my house) recipes are consistently excellent and I have really learned a lot of tips for making multiple recipes and making entertaining easier. Shrimp is a special treat at our home. This recipe looks yummy. Perfect for New Years party!